If you put on your glasses and read Duke's dog food label, you may have come across the ingredient "tricalcium phosphate." With so many additives in food, it's difficult to understand what's healthy, and necessary, versus what's an enhancer. Just because an ingredient is unfamiliar doesn't mean it's bad. Tricalcium phosphate is a mineral salt used in dietary supplements, baked goods, baking ingredients and processed foods. Phosphates, naturally occurring minerals, are essential nutrients in human and animal diets. Calcium and phosphorus work together to build strong bones and phosphorus helps the body eliminate waste. Tricalcium phosphate is not in most pet foods, but those that do use it are safe for Duke and Kitty to eat. Natural News performed an analysis of pet food ingredients and determined about 13 percent of pet foods use tricalcium phosphate. The mineral performs two roles: It helps in processing food because it's an anti-caking agent and acts as a dietary supplement of phosphorus to help maintain alkaline/acid balance. Other phosphates are in pet food as well. Cat food will sometimes have phosphoric acid for proper pH adjustment, which is helpful for maintaining good urinary health. Canned cat and dog foods use a variety of phosphates to make protein more soluble, and pet treats often add phosphates for tartar control. They can show up as sodium tripolyphosphate, tetrasodium pyrophosphate and sodium acid pyrophosphate. 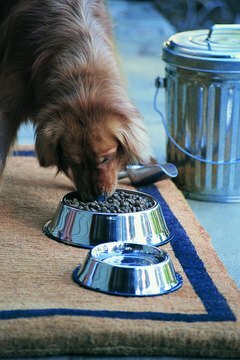 Some ingredients in pet food aren't necessary or have healthier substitutes. According to the Dog Food Project, the emulsifier glyceryl monostearate is one to avoid because of potential impurities, depending on how it's manufactured. Propylene glycol serves to keep semi-moist kibble from drying out but is toxic in large amounts. Preservatives are necessary in kibble to keep it from going rancid, but artificial preservatives such as BHA, BHT, propyl gallate and ethoxyquin are best avoided in favor of natural preservatives such as vitamin E, citric acid and rosemary extract. Artificial preservatives are currently approved for use in the United States, but BHT and BHA are banned in many countries; ethoxyquin is under review for safe use; and propyl gallate is suspected of contributing to liver disease.